Voyageur Quest came from an idea I had during a long arduous canoe trip in Northern Ontario. I was working for another company at the time that specialized in taking people out of their comfort zones for 23-day canoe trips. The days were long and the food limited. The scenery however was spectacular. Waterfalls, jack pine forests with sphagnum moss, caribou swimming across lakes, pike and walleye on every second cast. It was so unfortunate that we had to rush through it on another day paddling and portaging from sunrise to sundown. Why couldn’t we come back here and stay for a week! Have nowhere to go! Explore, swim, fish, – and bring lots of good food! Why not come back with friends and have a comfortable time in the wilderness! The idea of a comfortable wilderness vacation was born and Voyageur Quest took out its first comfortable adventure to Algonquin Park the next fall. It was 1991. Over the last 15 years, Voyageur Quest has built all of our trips on the idea that a trip in nature can be a vacation- something fun and enjoyable. Choosing Algonquin Park, and more specifically the northwest corner of Algonquin Park, to be our home was less arbitrary. The Algonquin area has deep roots in my family. My mother Marion Langford (nee Barker) was Head Counselor of a summer girl’s camp, Camp Inawendawin on St. Mary’s lake near Dorset, Ontario in the 1950’s. Her days were spent tripping through Lake of Bays on sailboats or into Algonquin in canoes. Prior to working at Inawendawin, my mother spent all of her summers on Lake Nipissing and Powasson. In the 1920’s to 40’s, my mother’s grandfather (my great grandfather), Thornton Reid lived and worked in Powasson and had a cottage at Lighthouse Bay on Lake Nipissing. He was an expert fisherman and loved to eat fresh pickerel for breakfast every morning. The picture to the right is of my Grandmother and great grandfather sitting on the shores of Lake Nipissing. The picture below is of my grandfather, Elzwood Barker, fishing for speckled trout on the South River in the 1920s. Powasson and this part of the South River are just a short drive away north from our present day lodge and canoe trip outpost locations on Surprise and Kawawaymog Lake. On the other side of my family, Ken Langford, a cousin of my father’s great grandfather, started one of Canada’s oldest canoe companies Langford canoes, located in Dorset, Ontario. 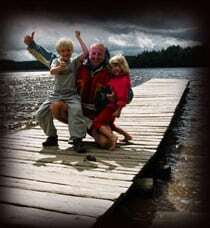 My love for the Algonquin area, canoes, and a sense of adventure come from these family roots. Since taking out our first trip in the summer of 1991, Voyageur Quest has evolved from a one-person operation to one of Canada’s most recognized adventure travel companies. Our journey has been immensely satisfying. Growth has been slow and steady- one customer at a time. Our customers are what have made this journey feel so special. Our business is small and unique, not exactly the type of place you find in mainstream travel agencies. Our customers have had to search to find us and when they did find us, it was like a reunion of old friends. Kindred spirits who love to be off to be off the beaten track. We have been so incredibly lucky to work in a business that attracts such interesting and well-traveled guests. Our adventure vacations today are considered “Best in Class“. In 1998, the Canadian Tourism Commission selected our 3-day Algonquin Park winter adventure, Footsteps of the Pioneer as the Best Winter trip in Canada in the Learning and Culture category. In 1999 and again in 2000, Voyageur Quest was again selected by the CTC as one Canada’s top 50 Ecotourism and soft adventure companies. We are proud of our past but continue to work very hard to find new ways to improve our trips and offer excellent value to our guests. In 2011, Voyageur Quest’s Algonquin canoe and log cabin adventure was selected by the Canadian Tourism Commission as of of Canada’s “signature experiences”. Our Algonquin Log Cabin, built in the fall of 1997, was created as a way for our guests to enjoy a wilderness trip but avoid sleeping outside. Our Algonquin Cottage Outpost purchased in 2000 and renovated in 2003, offers deluxe solar -powered comfort for those couples and families looking for a private adventure. Voyageur Quest today is a small team of hard working individuals who are determined to provide the best possible adventure experience to our clientele. Collectively, our mission continues to be to introduce people to the outdoors in a fun and comfortable way.